Most companies understand that good working conditions, competitive salaries, and strong benefits packages attract high-quality professionals. Yet at the same time, many of these competitive companies are slashing their lower-skilled employees’ wages, benefits, and other compensation. 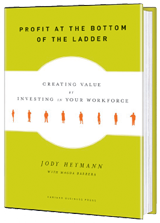 Profit at the Bottom of the Ladder details the experience of businesses which have taken a different approach. They have been profitable for their owners and shareholders not only while being profitable for all their employees but because they have been profitable for their employees at every level. Featuring cases from companies around the globe, including Novo Nordisk, Costco Wholesale, American Apparel, Xerox, Banco de Credito, Autoliv, and many others, Profit at the Bottom of the Ladder shows what works—from stock options for bakers to flexibility for factory workers to career tracks in call centers. Drawing from a six year study of companies around the world, Heymann discusses the experiences of firms across diverse sectors ranging in size from 27 to 126,000 employees and provides a blueprint for how firms and their employees can profit together.